Hi lovelies! 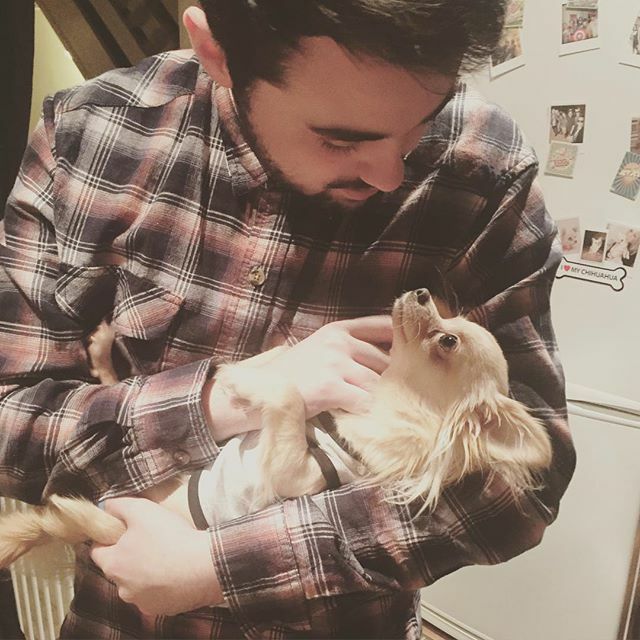 Bit of a different one for you all today, as this post is going to be all about my advice and tips if you're thinking of getting a dog, specifically a Chihuahua. 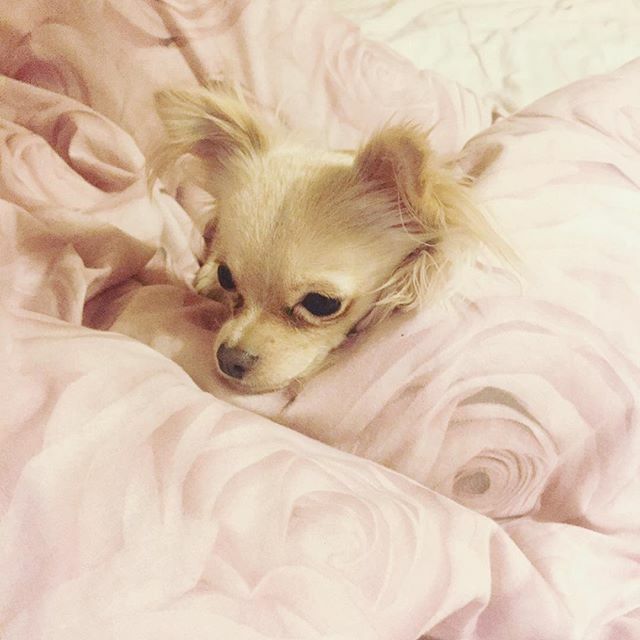 When I was looking into dog breeds before getting my gorgeous little Belle, I was obsessed with reading new puppy blog posts, tips and advice and Chihuahua facts, but I didn't come across too many blog posts like this one, so I thought I'd do one myself. 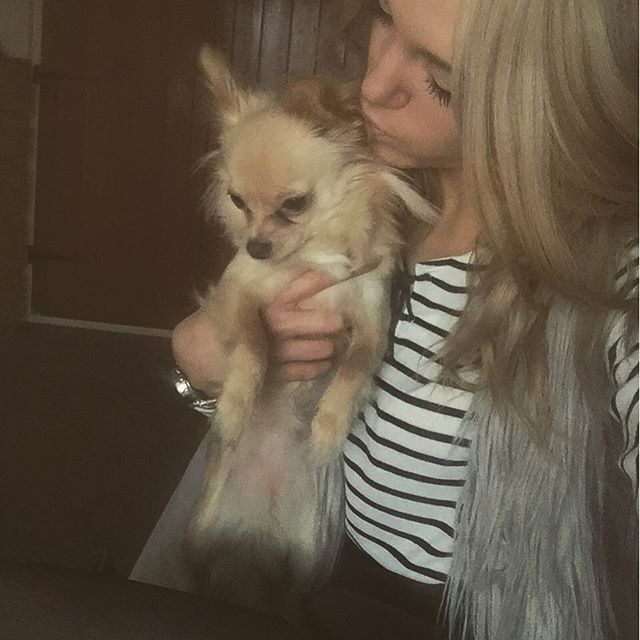 So if you're thinking of getting a Chihuahua, or any other small dog, or you're just dog obsessed and want to hear my thoughts on the breed, read on! Warning, this will be a long one! Before I get into this, I'm gonna do the annoying blogger disclaimer, so to make it quick, I'm not an expert, I just bloody love my dog. Okay? Let's continue! So, I got my Chihuahua, Belle a little over a year ago in November 2014 and before getting her, I read up on a few different breeds, because there were several things I needed to consider. First up, at the time, Darren and I were living with my Parents, but as we had plans to move out in the next year or so, we knew we wanted to get a fairly small dog, as we'd be renting our first house and it's hard enough to rent with any pet, let alone a huge dog! Side note, this is definitely something worth considering if you're going to be renting, we were lucky enough to find a cottage to rent that allowed a small dog, but we wouldn't have been allowed a larger breed. We also wanted a dog that didn't need too much walking, as we don't really get the time to do 2 plus walks a day and didn't want the guilt of leaving a very active dog bored and restless. Other reasons for looking into a smaller breed were simpler reasons, such as buying good quality dog food works out a lot cheaper as they eat much less, they're more portable (I didn't have my smart car at this point, but I'd have been screwed if we had a big German shepherd to content with!) and we knew our first house wouldn't be huge and we knew it'd be unfair on a big dog to be cooped up and let's face it, little dogs are SO FRICKIN CUTE. So, now we knew we wanted a smaller dog, it was time to look at breeds, we didn't look at too many really before I came across Chihuahuas, but Darren loved the idea of a Pug or French Bulldog, however after looking into them, we decided while they're both adorable, Frenchies were still that bit too big and Pugs seemed to have a whole heap of health risks, which I think is often to do with over breeding/ interbreeding, which I know isn't always the case, but as this was going to be our first dog together without any patental help, we didn't really want to take any risks. I also briefly looked at Daschunds, but we were told you had to be very careful with them jumping on and off sofas, beds, stairs etc due to their short little legs as it can potentially be quite dangerous for them. This wasn't really going to put us off, but in the end, it was a toss up between a Daschie and a Chi and we saw Belle on a puppy site and fell in love. First and foremost, we made sure we visited the breeder, saw that the parent dogs were healthy and well looked after and went away to think about it before committing. Ideally, we'd have loved to have adopted a dog, but any shelters within a reasonable distance to us only had bigger dogs and no puppies. I do think we would adopt in future, but we just desperately wanted a puppy for our first dog. If you are going to buy a dog, then please, please make sure your breeder is legit, if the house is full of unhappy looking dogs, if it appears unhygienic, if they don't let you see the parent dogs or at least don't have any info on them, then get out of there -and if it's bad enough, report it, dogs deserve a good home! So, the day came to go and pick Belle up and we made sure we were prepared, we had two beds, a small crate, puppy training pads, food (we started her off on the same brand the breeder had given her and slowly transitioned her onto a different food), treats, a lead and harness, a carry case and enough toys to open a puppy daycare centre. So, we went to get her and despite crying in the carry case on the way home, she actually settled in really quickly, she ran straight for a cuddle with Darren before trotting her to have her first accident under the dining table - gross! Toilet training with Belle was actually really easy, she learned to use her puppy pads in just a few days and to go in the garden soon after. The thing to remember with small breeds is that they have teeny tiny bladders, so particularly as a puppy, you need to give them the opportunity to go frequently. With enough training though, I found this little Chihuahua in particular very easy to housebreak. However, Chihuahuas aren't great with the cold, so in particularly cold weather, we do still use puppy pads indoors which isn't ideal, but she can be quite stubborn in not going out for very long in the cold. This is just a personal preference of ours, as while we do live in a house, not a flat, we still only have a very small garden with no grass, so unless she's on walk, she doesn't get to go on the grass many times throughout the day and concrete and stones are just too cold! Chihuahuas are generally known for being either a quivering wreck in the face of any stranger, or a ballsy, yappy little terror without much inbetween and while they do display these qualities, there is also a massive grey area. 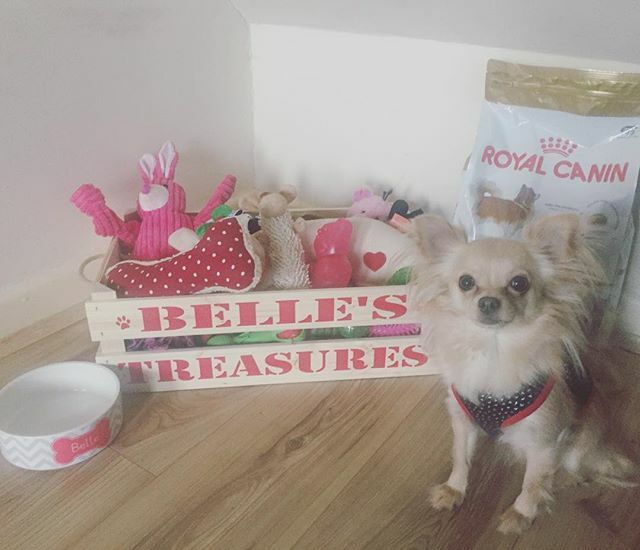 As a tiny puppy, Belle loved anyone and everyone and hardly barked at anything and showed little to no fear of anything, however as she grew up, she developed more typical Chihuahua traits. This wasn't through us keeping her away from people, or teaching her to bark or anything like that, but we did notice after a few months, she began acting a bit afraid of new people. Oddly enough, this wasn't with everyone and to this day, she goes one of two ways with new people, either the instant 'OMG YOU'RE MY NEW BEST FRIEND ILYSM LET ME LICK YOUR FACE!!!' or with a few people, it's more 'YAP YAP YAP I'M SO TOUGH wait.. MUMMY STRANGER TRIED TO STROKE ME I'M SCARED!' Cue shaking, barking and hiding behind mine or Darren's legs. Generally though, as long as we show her that whoever the person is is not a threat (i.e. Give them a hug, sit and chat with them while letting her get on with her suspicious sniffing), she'll always warm up to anyone we have over and will end up on your lap. This is rare though and because we've tried to train her to be sociable, guests aren't generally a problem. So, if you don't have the patience for a nervous little dog who may need a lot of reassuring in unfamiliar situations, a Chihuahua may not be for you. However, if you love cuddles and want the kind of dog who will sit on your lap for hours on end, a Chihuahua is perfect. As I've said, Chihuahuas don't need loads of walks, but they do need stimulation and exercise like any other dog, so one short walk a day as well as lots of playing indoors is enough to keep Belle fit and healthy and when all her playing is done, she loves nothing more than snuggling up under a blanket on mine or Darren's lap. She's very cuddly and sweet and once she's comfortable with someone, she'll jump up on her back legs waving her paws in the air like a child just to be picked up and snuggled. 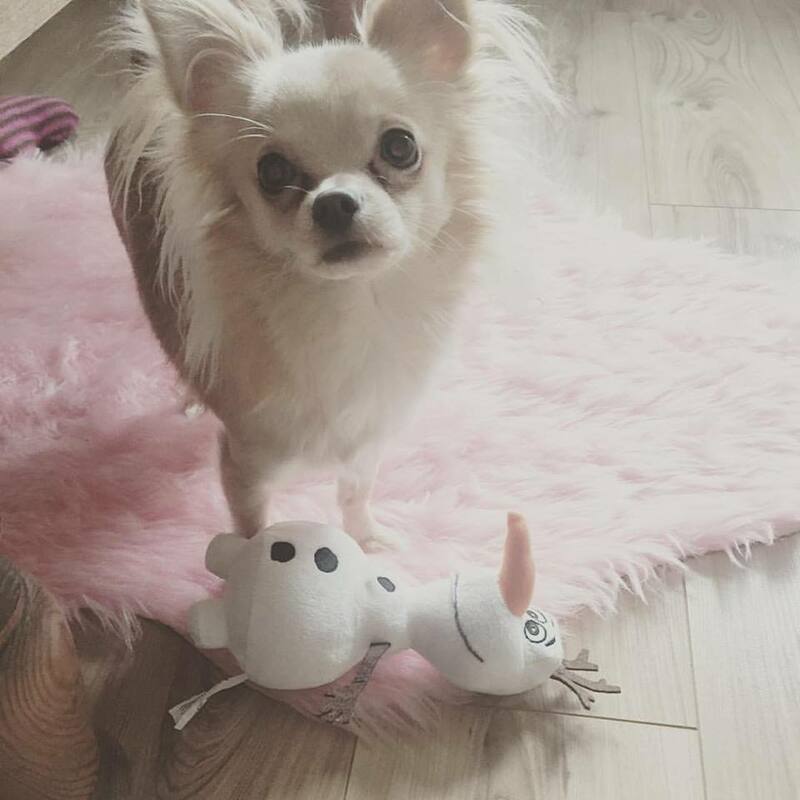 Chihuahuas are known for having a lot of character and our little lady is no exception! She's very clever and learns quickly, she's also very observant and notices that if someone is a little nervous, she needs to be calm, for example, my Nan can't see very well and Belle instinctively knows to be calm, sit still to be stroked and not get under her feet.. Too much! Whereas if Darren's friends come over, she knows it's playtime and it's perfectly okay to jump on their shoulders and nibble their ears. This doesn't mean they don't need to learn though firm but fair training is needed to calm down any behaviours you deem inappropriate. As for sleeping arrangements, Belle would be on the bed with us all night if she could and we do let her up for cuddles before bed and in the morning, but at night she sleeps in a crate, big enough to have a little wander round but not so big she feels intimidated. We initially only got the crate for training purposes, but she loves it and sees it as her little den, so she stays in there with water and a Kong toy (perfect to keep them amused for a while!) when we go out too. We found she actually doesn't like being left in a whole room alone, possible because it feels like a big, empty space, but she loves her crate. This is fine with me, as I know she's safe and secure, but it's important to remember this doesn't work for all dogs! So, a quick list of pros and cons for those who've made it this far, or those who are skimming and want something quick and easy to read! Great for those without much time for walking. 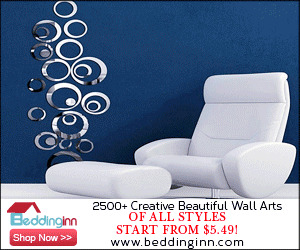 Lovely 'lap dogs', love to cuddle and have naps with you! Very portable, in our experience, very good in the car. Easy to groom, Belle only needs occasional baths and doesn't shed too badly. They can develop separation anxiety, however, we trained Belle gradually to be alone, which worked for us, so I'm sure you'd be fine too. Sometimes stubborn, she's a fast learner but she won't always do as we say! Can be nervous, which comes across yappy and potentially aggressive, need reassuring. Picky eaters! I didn't mention this yet, but we struggled to find a food Belle liked, she turned her nose up at so many before we settled! Scavengers - fussy yes, but only with dog food. They're tiny and can get into anything low down so you really do need to keep of top of the cleaning! Regular feeding needed, some would disagree but I believe small dogs should have three small meals a day as their little tummies can't always handle large amounts of food at one time. Sensitive to the cold, we have to be very careful in the winter particularly on walks, if it's cold enough, we often take her for walks around Pets at Home rather than outside. Quite clingy aka, always under your feet! You really learn to watch where you step with a Chihuahua! This post was bought to you by Royal Canin and their #TheRoyalFamily campaign, which provides information on all dog breeds and helps you to choose the perfect dog for you by inputting info such as where you live, how much time you have your experience level with dogs, which I think is fab, particularly for those that are undecided on a dog breed! All opinions though are of course my own and should be taken as such, as I'm definitely not a puppy pro! That's all I can think of for now, but if there's anything else you'd like to know please leave me a comment below!